It’s been a great year for Instagram with some exciting new features and updates which not only help to make the platform even more exciting for users, but offer huge opportunity for digital marketers. Let’s take a look at some of the best ways to reach your audience on Instagram as we start planning 2019. Insta Stories has been a huge success for Instagram, and as its daily user-base has grown by 150 million in the last year, it should definitely form part of your Instagram marketing strategy. Why is using Instagram Stories beneficial? Another great feature to concentrate on in the months ahead is Insta Stories Highlights, which allows users to create a permanent home to show off their ephemeral content without posting to the main feed. It’s easy to create and edit a highlight, so it can be easily accessed by followers. You can add up to 100 photos or videos to a story highlight. It makes the process of seeing what a brand has to offer much easier as all your content can be compartmentalised into the different services you offer as a whole. With Stories Highlights, content is more organised, simpler and faster to navigate through. With 400 million people watching Instagram Stories every single day, and the cost of Facebook advertising increasing, Instagram Story ads are the cheaper, more innovative way of advertising your products to a larger reach as we move into 2019. With its full-screen, vertical format, businesses can share photos and videos that submerse followers in their content. With the ability to target your ads by reach, video views, traffic, conversions, app installs and brand awareness, there’s real potential to drive business results. The new shoppable stickers for Instagram Stories mean businesses can tag physical products from their e-commerce platform. When users click on an item in a post, they’re able to view the item name, price, and description. Shoppable Instagram Stories stickers can be placed on both images and videos, so it’s a great way to offer product information without coming across like you are constantly trying to push a product on your followers. The great news is that you don’t need to be verified or have 10,000 followers to use them! Influencer marketing continues to boom as brands collaborate with opinion leaders to enter an already-established community to promote their product. Micro-influencers have become a new trend on Instagram. It’s proven that micro-influencers, who have a media following of anywhere between 1,000 and 30,000, drive more significant engagement than influencers with a larger following. Collaborating with micro-influencers allows you to save on promotion as their rates are lower. You can expect a higher average engagement rate and also establish contact with them in order develop a longer term relationship and collaborate in the future. IGTV is a new Instagram feature and app for sharing and viewing video in a vertical and full screen format. It offers the potential to create hour-long episodes of a long-term series, or to use Instagram TV as an extension of your standard Instagram profile. Play-Doh has used IGTV to great effect with its series, “The Play-Doh Show”, which brings creative, colourful fun to life. While the series likely has kids fighting over their parents’ phones, it’s fun for all ages and you can do it too! Instagram provides a wealth of opportunity to reach current and new audiences in exciting and engaging ways. Definitely not a platform to be ignored when planning your 2019 marketing strategy! If you want to find out how to take your social media offering to the next level, contact us at agency:2 on 0203 598 9194. Mark Zuckerberg forecast that in 2018, a whopping 90% of Facebook’s content will be video-based. Facebook Live is on course to further develop this year and Facebook will also be introducing its new offering: Watch. Watch is a new platform to broadcast live or recorded shows which consist of a series of episodes and follow a storytelling theme. These will have a high degree of personalisation and allow viewers to connect with the viewing habits of members within their social network. For example, people can see ‘what friends are watching’ and see their reactions and comments in real-time. We predict a rise in video hangout platforms in 2018, such as Houseparty, focused on allowing friends to hang out digitally. agency:2 Top Tip: Brands and digital marketers should ensure that in 2018 they are maximising their use of trending video platforms, such as Instagram Stories and Facebook Live, to boost their engagement and reach. Marketers should adopt a mobile first strategy based on users’ viewing habits and closely monitor how the latest innovations, such as 360 videos and augmented reality, can help take video to the next level. Currently over 2.5 billion people use messaging platforms globally and this technology is fast evolving. In 2018 we predict increased brand participation in messaging platforms, such as WhatsApp, WeChat and Messenger, and utilising chatbots to interact with fans with a higher degree of personalisation. Gartner has forecast that in 2018 30% of our ‘conversations’ will be assisted by smart machines. These forms of ‘conversations’ are the preferred form of communication for Generation Z, who more than ever, have increased purchasing power. agency:2 Top Tip: It’s important for brands to build up a persona around chatbots that stays true to the company’s values and ethos. New tech should always be carefully tested by a diverse range of audience groups for ease of use before implementation. With the rise of Instagram Stories and Snapchat, time sensitive ephemeral content is becoming increasingly important for brands, as well as individuals. These fleeting pieces of content, typically lasting just 24 hours, are often the best way to reach Millennials and Generation Z, as they can be less formal and more authentic. They are effective for communicating short-term offers, or for storytelling during live events. agency:2 Top Tip: It’s vital that brands build ephemeral content into their social media strategies for 2018 and realise that this type of short-live content can be less polished and more informal than permanent content, which is part of the appeal. Connecting this content with a brand’s influencer strategy can work effective for a time-sensitive platform takeover. 2018 is set to be an exciting year for social media. 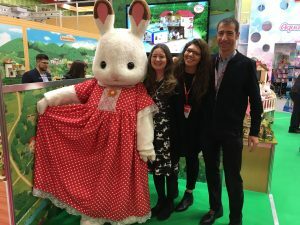 Members of the agency:2 team were excited to visit Spielwarenmesse in Germany, the much anticipated international toy fair in Nuremberg which took place during the first week of February . The fair showcased over 1 million toys from over 60 countries. It was the ideal place to explore the latest developments within the toy world, meet up with international contacts and experience ‘The Spirit of Play’! Our team’s favourite area at the toy fair was the Trend Gallery, where 1,000 m² showcased the latest global innovations and exciting new ideas for 2017. Some of the top trends on display this year included tech toys; focusing on everything from electronic activated pets, virtual reality, artificial intelligence, drones and augmented reality. It was clear that licensing is here to stay in the toy world, with Star Wars and superheroes having a prominent presence this year, and impacting all products from scooters to backpacks. Promoting girl power and updating classic role play toys were other popular trends, with storytelling being an important focus amongst niche start-ups all the way to global brands. Exciting new products require new and inventive methods of communication through social. Complex toys are best showcased on videos and immersive Facebook canvas ads to effectively highlight their numerous attributes to consumers. The team at agency:2 is looking forward to using our innovative Social Insight Engine technology to hyper-target parents on social media, and clearly communicate these exciting messages in 2017. Christmas comes early on Facebook: How will you maximise your #smm? Christmas comes early on Facebook: How will you maximise social media during this busy period? The countdown to Christmas is now officially on…only 39 more days. Can you believe it? Each year consumers say the same thing: the build up to Christmas gets earlier and earlier. Audiences are surely switching off from the Christmas messaging….or are they? Did our Christmas campaigns hit the mark last year? How can I beat my competitors during this Christmas period? Is my agency doing the best possible job with my Christmas budget? Christmas conversation begins on Facebook on October 24 (yes, October!). 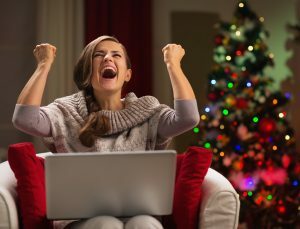 Black Friday, November 25, is the biggest shopping day of the year for women on Facebook. Last year Cyber Monday, November 28, online spend totalled £968m in the UK. The build up to Christmas and last minute shopping takes place within the period from 8-31 December. Boxing Day is topical on Facebook throughout all of December with an amazing 21.6m interactions related to it. The first two weeks in January can offer some of the best value CPMs seen all year on Facebook. How can we use this information and insight in our social marketing to enhance our Christmas campaigns and capitalise on the increased spend? a) It’s always important to stand out from the crowd as this is a very busy period on social – 32m pieces of content are posted to Facebook every day over Christmas! Your brand will need to be the best e.g. use video to boost audience reach. b) You can widen your audience by adding grandparents, uncles and aunties, as they are the true Christmas buying audience for anything over £50. c) Increase reach further through audience insight tools such as the Social Insight Engine. For example, by using our unique ad serving software we can select parents with siblings in a similar age range, and therefore sell more to the same user. Overall, this will improve return on investment. d) As it’s such a busy period, clever targeting is important to get your message in front of the right people at the right time. Linking targeting to consumer behaviour and interests is a great way of making an emotional connection, which can lead to strengthening purchasing intent. e) It is also important to connect social media activity with offline behaviours, PR and other marketing activities. f) Use Facebook’s unique abilities – for example, friends can tag each other in comments e.g. ‘this is the one I wanted you to get for my daughter’. You can’t do this as easily with other marketing channels so make the most of these features. g) Make sure your posts are mobile friendly as 86% of Christmas posts are shared on mobile and 88% of all videos are shared on mobile. 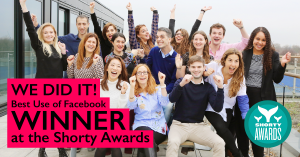 Here at agency:2 we have already applied these strategies to our social media marketing for some of the world’s leading brands, achieving fantastic ROI for our clients. Find out how you can take your social offering to the next level. Call us on 0203 567 1380. 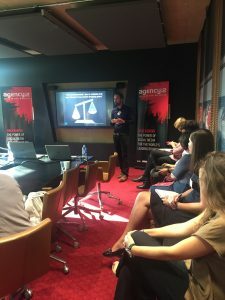 We were thrilled to host the ‘Be a Leader in Social Media’ masterclass as part of Social Media Week’s global event series on 16 September, at our offices in London. This is the 3rd year we worked with Social Media Week London. Our event sold out quickly (!) and we welcomed senior marketers from a wide range of sectors and companies, including Virgin, Young’s Pub, Ella’s Kitchen & University of West London to our event. We were delighted to welcome Josh McBain (Head of Innovation, Future Foundation) who shared some key insights from DMA research report ‘The Future of Customer Engagement’. Our audience was very perceptive and asked many questions, which allowed for the sharing of many practical learning points. Twitter: What we know in 140 characters or less! It’s been talked about and talked about, which social network is growing and which is declining? Which should we invest time in and which should we leave behind? Today we focus on Twitter; despite declining figures, we still think it’s one to keep in your toolbox. What do you think about Twitter? Are you still on board and eagerly awaiting new developments or have you already said #ByeByeTwitter? Twitter on the Decline – Fact or Myth? As a leading social media agency, we have been actively following Twitter performance announcements as they unfold, and are constantly attempting to determine what the future holds for the platform. According to Business Insider, the Twitter Active User Base figures are at an all-time low. Not only has there been no growth, but active users have been steadily declining. This is worrying for investors, as the falling rates prove that Twitter cannot reach anywhere near Facebook’s user figures. According to The Verge (see here), Twitter’s 320 million monthly active users are way behind Facebook’s 1.59 billion monthly active users. Will Twitter be a serious social media contender in 2016/2017? Even if this character limit change did come into play, it would seem that it just wouldn’t be enough to transform the platform. With Facebook’s innovations being introduced at lighting speed, Twitter will need to do a lot more to be thought of as more than a glorified news channel. What do we think here at agency:2? Judging by recent trends, we predict that by the end of the year Twitter stands to lose up to 100 million active users if it doesn’t act fast; this will result in a huge loss in advertising revenues and equally devastating, a great loss in investor confidence. 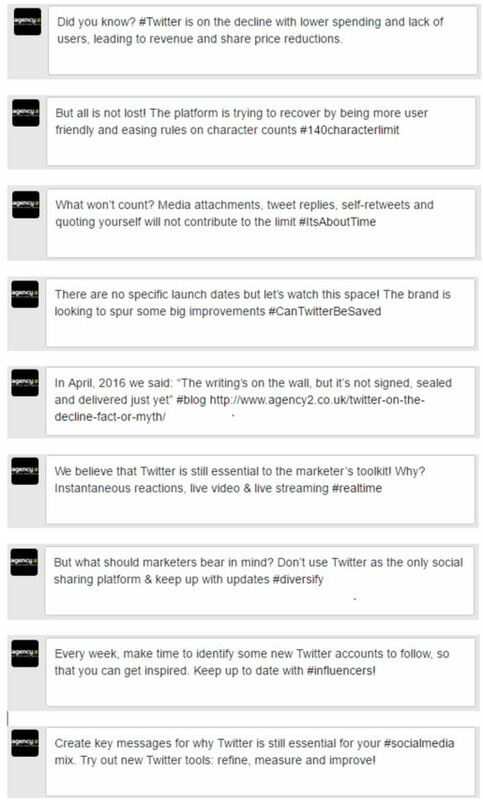 Will our agency be pulling the plug on Twitter? The writing’s on the wall, but it’s not signed, sealed and delivered just yet. For the moment, Twitter remains a viable newsworthy platform, thus allowing agency:2 to be in control and up to speed on the latest social media insights and news stories. We continue to proudly support our clients brands on Twitter, constantly making valuable connections with their customers worldwide. Twitter may need an overhaul of its basic features to inspire user growth; however, focusing on its speed and dominance in the live conversation sphere seems like a much smarter approach. If there is one thing Twitter still has over Facebook, it’s the service’s uniquely instantaneous reactions to live world news and events as they happen in real-time.